Cockroaches are among the most common and most repugnant insects. They are nocturnal pests that scurry away when exposed to light. More than just a pest, cockroaches can be hazardous to your health. 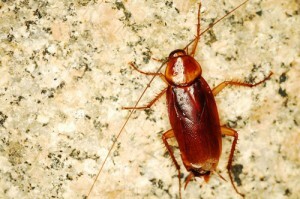 The American cockroach can infect human and pet food with bacteria. Its cousin, the German cockroach, is thought to carry disease-causing organisms. Cockroaches are linked to allergic reactions in humans. These pests come in your home looking for food, warmth, water and darkness. They can enter through gaps around your doors and cracks as small as 1/16 inch. Once they are in your home, cockroaches can be difficult to eliminate. They are extremely hardy and can survive on as little as the glue on a postage stamp. The best defense is to keep the pests out of your home. Keep your home tidy. Don’t let paper, plastic bags and other items accumulate. Cockroaches like corners and narrow spaces so pay extra attention to those areas. Cluttered spaces create hiding places for them. Clear drawers, cabinets, pantries, floors, tables, sinks and counters often, especially in your bathroom and kitchen. Corrugated cardboard can be especially attractive to cockroaches. Don’t leave dirty dishes in the sink or anywhere else in your home. Clean dark places often including spaces behind appliances as well as cabinets that may not be used often. Empty and clean your garbage bin often. Throw away old fruit and vegetables in an outside garbage bin. Keep pet food in tightly sealed containers. Do not leave out pet food overnight. Pay extra attention to the spaces between your stove and cabinets where grease and dropped food may accumulate. Don’t give cockroaches an easy source of water in your home. You should never leave dishes filled with water in your sink overnight. Look for leaks, condensation and other sources of moisture, and fix the source. Check the drip pans of your refrigerator and freezer often to make sure they are clean and dry. Keep leaves and other debris away from buildings. Trim plants and shrubs often. Don’t use too much mulch as it can create ideal conditions for cockroaches. Use garbage bags, and keep your bin closed securely. Don’t keep a garbage bin too close to your home. Seal cracks and other openings. Don’t leave cardboard boxes and other debris on your porch or carport. If you live in an apartment or duplex, seal spaces where plumbing or electrical wiring goes through walls. Steel wool can be used in these spaces. Escutcheon plates should be placed where plumbing enters the walls. A single sighting may mean you already have a problem because cockroaches reproduce quickly. If you have an infestation, you may find egg cases, feces or dead cockroaches. The German variety can leave an oily, musty odor. Call Casner Exterminating today if you see signs of cockroaches in your home. To effectively deal with the problem, comprehensive care is necessary. Spot killing roaches will not stop an infestation. Casner Exterminating has provided professional pest control services for more than 30 years. They are the leading resource for pest control in San Jose, CA and Ventura, CA. Exterminating cockroaches can be difficult and requires diligence. Casner technicians have the training and experience vital to keeping your home free from pests.